Although there are many variations in pasta dough recipes, here is an egg pasta recipe to get you started. We encourage you to experiment and create your own unique recipe. View the full recipe below. Tip: doughs can also be colored with ingredients like spinach, tomato or squid ink. 7. Begin Rolling Out the Pasta: Set your pasta machine to the thickest setting (usually marked "1"). 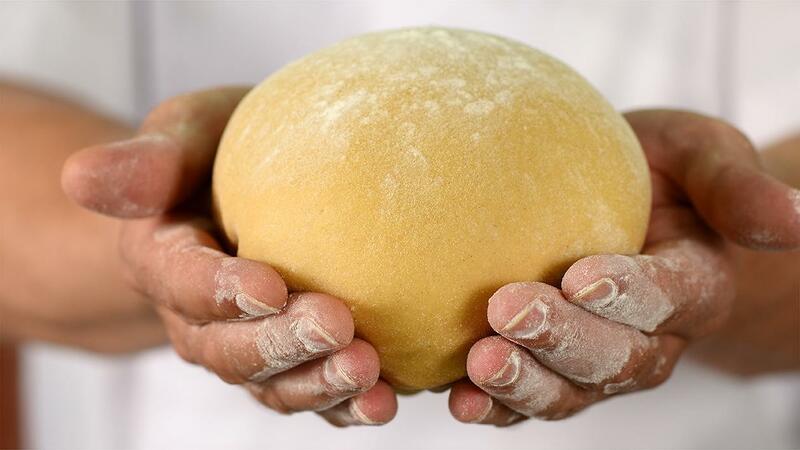 Flatten one piece of dough into a thick disk between your hands and feed it through the pasta roller. Repeat once or twice. Fold this piece of dough into thirds, like folding a letter, and press it between your hands again. With the pasta machine, still on the widest setting, feed the pasta crosswise between the rollers (see picture). Feed it through once or twice more until smooth. If desired, repeat this folding step. This helps to strengthen the gluten in the flour, giving it a chewier texture when cooked. 8. Thin the Pasta: Begin changing the settings on your roller to roll the pasta thinner and thinner. Roll the pasta two or three times at each setting, and don't skip settings (the pasta tends to snag and warp if you do). If the pasta gets too long to be manageable, lay it on a cutting board and slice it in half. Roll the pasta as thin as you like to go. For linguine and fettuccine, I normally go to 6 or 7 on the KitchenAid attachment; for angel hair or stuffed pastas, I go one or two settings thinner. 9. Cooking, Drying, or Freezing the Pasta: To cook the pasta immediately, bring a large pot of water to a boil, salt the water, and cook the pasta until al dente, 4-5 minutes. To dry, lay the pasta over a clothes drying rack, coat hangers, or the back of a chair, and let air dry until completely brittle. Store in an airtight container for several weeks. To freeze, either freeze flat in long noodles or in the basket-shape on a baking sheet until completely frozen. Gather into an airtight container and freeze for up to three months. Dried and frozen noodles may need an extra minute or two to cook.